Our featured recipe or snack can be considered a vegetarian or vegan snack. But please don’t shy away, if you enjoy eating meat and vegetables, this is a snack for you as well. One ounce of beet and sweet potato chips has 1.37 milligrams of vitamin-E, which helps protect your cells from the damage of oxidation, which otherwise can increase your risk of heart disease and cancer. This amount of vitamin-E is 9% of the 15 milligrams of vitamin-E you need each day. Veggie chips also have small amounts of iron, potassium, vitamin-C and vitamin-K. If you do buy your veggie chips prepackaged, you will find they are baked with canola oil and 101 milligrams of sodium, unless you buy sodium free chips. Even if the canola oil is non-gmo and cold-pressed, it is still a omega-6 oil. This fatty acid can cause inflammation and in time bodily pain in the areas were the inflammation persists. You could make a healthier snack by baking your own veggie chips. 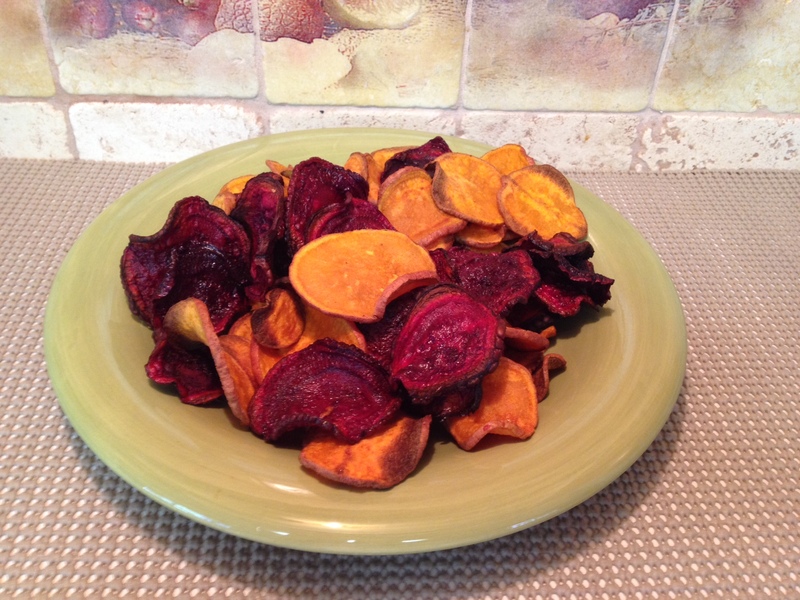 Making your own veggie chips is a smart way for you to create your own nutritious snack. 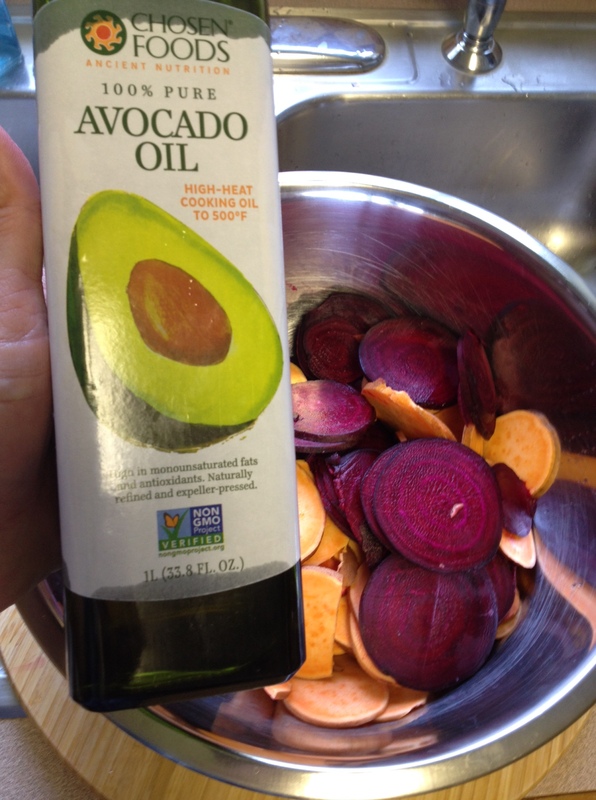 It is really simple, just drizzle olive oil or avocado oil over thinly sliced vegetables, such as beets and sweet potatoes. You can sprinkle them with dried herbs, spices and Himalayan salt (optional) and roast them until they’re crunchy. Wash your root vegetables thoroughly. Then cut off ends to make flat. Next, using a mandolin on thin slice, pass root vegetables over slicer, until all are sliced. Next, place sliced root vegetables into a large bowl and add 1/2 cup of avocado oil and toss till vegetables are well coated. At this time you can add other flavors, like sugar and cinnamon, or a little Himalayan salt, if you wish. The flavor is your choice, so be creative. Note though, these root vegetables do bake up sweet. Adding a flavor is just a added delicious bonus. Next, place a wire rack onto a cookie sheet. Place slices over wire rack. It is okay if they are touching. Now with my first batch, I found out the sweet potatoes bake in less time, were as the beets need longer baking. 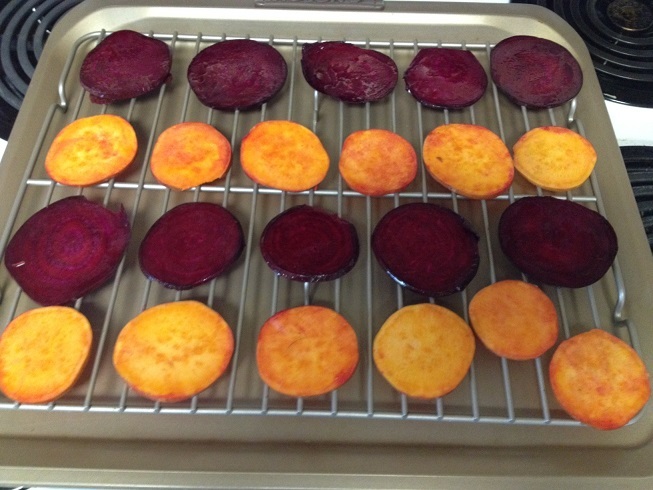 Contrary to the image, bake your beets first for 30 minutes. Then bake your sweet potatoes next for 20 to 25 minutes. If the sweet potatoes bake beyond 25 minutes, they start to burn. When chips are done, remove from oven and put aside to cool. Once all baked chips have cooled plate and serve. Place left overs in an air tight container. Beware if you have others in the house at the time of baking your chips, you will not end up with, what you started with. Just a little hint. Enjoy!! This entry was posted in Brunch or Lunch, Party Favorites. Bookmark the permalink. Yes RoSy, they are sweet root vegetable chips. Let me know if you dared. Thanks for stopping by and commenting, as well as RT this!! Thanks RoSy!! I love beets and sweet potatoes so I’d love to try this! Hope you do. It is easy and very time consuming. Just a tip though, I would advise against using Canola oil. It is an inflammation causing oil. If you can use avocado oil. If you live in the USA and near a Costco it only cost $10.99 for a liter. I always buy these chips in the bag. But as they use canola oil (which is inflammation causing) I decided to try my hand at making my own. A great snack to have around. Yes you can use olive oil. Most people will use the light olive oil, as it has a higher spoke point. But since the root vegetables are only in the oven for about 20 to 30 minutes, EVO oil should be fine. Give it a try, they are sweet and tasty. Thanks for stopping by and leaving your comments Luis. Have a great weekend! !